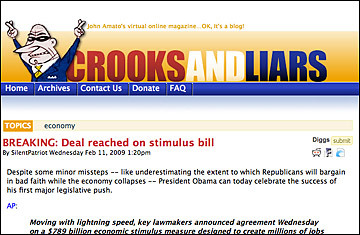 When professional musician John Amato launched the Crooks and Liars political blog in September 2004, it featured something that was quite novel in those ancient pre-YouTube days: video clips. Today, Crooks and Liars is among the most widely read political blogs on the Web, and Amato  now known in blog circles as "the Vlogfather"  is recognized as a pioneer of video blogging. The video selections  snippets from government press briefings, Congressional hearings and TV talk shows  are the sort of clips that Jon Stewart uses for fodder, but this is a chance to see the video in its original unintentionally humorous context. Amato leans liberal, but his blog is an equal opportunity attack dog, taking a bite out of the crooks and liars on both sides of the aisle. Sample Crooks and Liars post: I'm afraid Bill O'Reilly's Fox show is something of an existential threat to the existence of the universe. Entry you'll never see: Congressman Barney Frank said something incredibly stupid on MSNBC last night, but I forgot to record it. Sorry.